My baby, sweet baby — he’s 1! Last week was Oliver’s first birthday. After speaking with many preemie parents about approaching their child’s unexpected birth date, I worried I’d slip into a funk — remembering my hospitalization, steroid shots, the late-night ambulance ride, the blood pressure cuff that went off day and night . . . But somehow, it never happened. There was no funk, no sadness. Spencer and I took the day off to celebrate — and we did! Oliver didn’t know it was his birthday, of course, but it wasn’t like we could concentrate at the office. I just wanted us all to be together. We went for a walk, took photos, exposed Ollie to the magic of blowing bubbles. He laughed with us and grinned and squirmed in our laps, permitting my (many) kisses and trying his first cupcake. My parents and sister came by, too, and we sang “Happy Birthday” with gusto. On Saturday, we hosted family and friends for a big birthday blowout — and, in a weird way, it was healing for me. Not to harp on an old subject, but I missed my baby shower while I was hospitalized last spring. It might seem silly, given the seriousness of that whole situation, but I was devastated. I still have a hard time thinking about it. Having loved ones gathered at our house almost one year later to the day, when Ollie has come so far . . . that was therapeutic. And realizing I felt nothing but joy and gratitude on Oliver’s birthday? Well, I feel like I’ve turned a page. Ollie was born at 9:57 p.m. — about 14 hours after I was induced on a Sunday. I will always remember the sunrise that morning: the streaks of pink visible from our corner hospital room with the lights of Baltimore beginning to blink off. It was still dark when the kind Midwestern doctor came in to say we couldn’t wait: the baby needed to come that day. And by nightfall, he had. After Ollie was born and whisked off to the NICU, I told Spencer he could go be with him — my first experience with having my child outside my body. Until that moment, I don’t think I’d processed that my little someone was actually someone: his own someone. We were no longer a unit. I could no longer protect him. And maybe I never had, with a failing body and fearful heart. Clearly, I still wrestle with Oliver’s early birth. It can be hard for me to talk about preeclampsia. But as time presses on, I dwell less and less on how Oliver arrived and just rejoice in the fact that he did. He is well. He is happy. He is so very loved. Though Oliver was asleep by 8 p.m. on his birthday, Spencer and I stayed up to mark the hour. At 9:57 p.m. this April 12, we were sitting quietly with the television down low. We talked of Oliver’s arrival: the “practice push” that needed no practice at all; the soul-shattering pain that melted into instant relief; the doctor who called out, “Happy birthday!” and extended our baby for me to kiss before everything fell quiet, and I was alone. I thought of the exhausted, overwhelmed, half-broken woman collapsed in a hospital bed after the strangest day of her life. I replayed the moment I saw my son through blurry eyes, frantically asking for my glasses so I could see his face (I didn’t). A year later, we are tired — and we have been tested. I have laughed and I have cried, felt like I was going crazy and stepped back from the brink. Spencer has been by my side through everything, every good and painful moment: and though there were times we were not our best selves by any stretch, we were still those selves together. Our sweet boy is upstairs, asleep in the crib where I once slept, and I can’t help but laugh at how unprepared we were. Unprepared. That word in this context? Well, it’s funny. Because being “unprepared” means you could, in theory, actually have been ready — and that’s just not true. No one is prepared for parenthood. You cannot be prepared for parenthood. Even if you’ve changed 10,000 diapers, babysat all the neighborhood children, helped raise a niece or nephew, been a teacher or a nanny or just a concerned friend . . . until those little eyes look up at you, a face that leans always toward your own burning sun, needing everything you have to give and much of what you don’t . . .
How can you prepare someone for that? When I creep into my son’s room and see his little face peeking at me from between the slats of his bed, the way he “growls” and now reaches his arms up for an embrace, when he lowers his head to my shoulder or gently strokes my arm . . . these moments shatter me. In a good way. Nothing can prepare you for how much you’ll love this little person. At 1, Oliver is sweet and curious, funny and charming, active and so good-natured. Our boy has never met a stranger, offers smiles easily and misses nothing in his observations. He plays well by himself, but prefers company. He’s patient to a point, but soon wants your full attention. Ollie loves daycare and his first friends there, and we are beyond fortunate to have his wonderful babysitter in our lives. He lives for “The Muppets,” ABC’s new TV show. No “Muppet” movie or TV show or cartoon will do. Spencer and I have seen every episode dozens of times, even acting out the dialogue and quoting Kermit, Fozzie, Piggy, Pepe, Uncle Deadly, Rizzo and gang to each other out of habit. We live and breathe “The Muppets.” I’ll never look at them the same way again and, forever and ever, they’ll have a special place in my heart. Oliver is still toothless (! ), but we see the telltale white caps beginning to break through on bottom. We’ve been taking our time with feeding, still offering mostly formula in a bottle, but Ollie has been doing much better with a spoon. To date, the only food he has not liked is birthday cake! He gobbles up vegetables and fruits, and is starting to pick at Puffs and other small snacks. He’s more than content for you to feed him, though, and plays with utensils and sippy cups more than he actually uses them. Ollie rolls anywhere he wants to go, which is usually to the front of the television cabinet to look at “the baby” in the glass — and loves to kick his legs and smack anything (and everything!) with his purple rattle. He’s doing much better with balance, sits completely independently and is now doing a combination scoot/crawl that gives him some independence. From the moment he’s up until the moment he crashes, he is a study in motion. The boy does not like to sit still for a moment! Despite my best efforts, Oliver is just now starting to pay attention to books. His interest in them has mainly been to chew on and tear at them. But persistence pays off: I recently looked over to find my son reaching for a touch-and-feel book on his own. He runs his fingers across the “fur” of an animal or “wheels” of a truck, and loves turning pages by himself. The look of concentration on his face when he’s “reading” — bottom lip stuck slightly out; eyebrows furrowed — is priceless. Ollie strings together sounds easily, but hasn’t seemed to connect them to the world just yet. Everything is “ba ba ba” or “bob,” and he loves to grunt and growl while flapping his arms like an eagle. He screams out of happiness and displeasure, and is easily the loudest person in any room. When I get close to his face and encourage him with “Mama,” he often smiles coyly and puts a chubby hand on my arm or leg. We try again — “Mama, Mama, Mama”; Ollie giggles and looks away. I can’t help feeling like he knows I want him to say it, to say that “magic word,” and he’s just content to make me wait. But that’s OK. It will be worth it. Baby, sweet baby — I’ll always wait for you. There’s an unspoken camaraderie that forms in a room where no one wants to be. My son underwent minor surgery this week. It was planned, scheduled months ago — a procedure to correct something we learned about at birth. Padding down the NICU wing just days after he was born, a nurse pulled us aside to tell us there was an “issue.” Had we been told about it yet? But the issue was not life-threatening; it could be corrected. Nothing that should affect him in the long term. We took comfort in that. On Wednesday, we woke at 3:30 a.m. to get into the city by 6 a.m. for his appointment: the first of the day. Spence and I were fortunate to have my father — a well-versed D.C. driver — take us to the large facility. He sat with us all day, fielding questions from our family, as my mother- and father-in-law waited at home with dinner already made. I’d been dreading this moment since that first mention in the NICU: having to return to a hospital; watching Ollie go into an operating room; seeing him in pain. I had nightmares for weeks leading up to Wednesday, fear upon fear building like tortuous blocks in my mind. I willed myself to be calm: to get into a state of peace. Sometimes I felt angry again, wondering why our 10-month-old had to go through this — any of this — and, as usual, why we couldn’t be “normal” with a “normal” experience. As we sat in the waiting room, the families of 30 other patients filled in around us. We carried coffee and smartphones. Most wore matching looks of fear and exhaustion, springing to life as soon as Smith or Blair or Thompson were called to the front desk. It was like an airport waiting lounge, all of us unsure if we were coming or going. Parents studied a digital screen with the status of each OR. Patient in, 7:32 a.m. They kept us all informed. The place was loud — noisy, even — as relatives chatted nervously in small circles. Some napped, heads back or resting on shoulders; others tapped at phones, zoning out on Facebook. The desk phone rang constantly: nurses with updates. Name after name, family after family. We were an anxious crew. Older parents, younger parents, grandparents, siblings. Parents with children in wheelchairs; others with babies on a hip. Some with children too weak to stand. Others who — “Ella, please!” — just would not sit still. And I thought of our collective faces, a range of colors and expressions; wide eyes, closed eyes, eyes leaking fat but silent tears. We were wan and dull that morning. The nervousness beat like a pulse. I willed my heart to stop pounding. My mind to be clear. The panic to dull. When it was time to speak to his surgeon, to shake hands with the anesthesiologist and ER nurse and recovery nurse — an endless stream of faces I studied, people intimately tied to protecting my child — I wanted to beg them to be thorough. Focused. Caring. But I didn’t need to. It was obvious from each handshake, every soothing assurance, that they would be. It took four hours. We read in the waiting room, tapping our feet; we walked to the quiet cafeteria, chewing lifeless salads. They called for us at the front desk with updates, and each ring made my mouth go dry. See? I can still be sensible, I thought. Even when I’m scared out of my mind. The waiting board clicked with updates: OR in. PACU. Patient discharged. Finally, mercifully, it was our turn. Oliver has done so well — maybe better than his parents. He’s recovering beautifully and was back to his smiling self within a day. (The pain meds might have helped.) The surgery was successful, and we are so thankful he’s too young to remember a thing. After one rough evening when he first came home, he’s back to sleeping well and enjoying endless episodes of “The Muppets.” And I don’t complain. I thought of myself last April: rattled to my core, shaky and hurting, terrified at the responsibility of caring for this tiny child. Worried about our future. Afraid of doing something — everything? — wrong. Nervous to even press a finger into his tiny, delicate palm. But I am not who I was 10 months ago. I am not even close to who I was 10 months ago. I scrounged up all the patience and strength I possessed on Wednesday. I stood at my son’s bedside, leaning on my husband as we listened with the dedication of med students to Ollie’s team. Hanging on every word. We asked questions. We took notes. We rubbed our son’s head, running delicate fingers through the dark curls that have suddenly sprung above his ears. Sometimes I had to sit down — to gather myself, to breathe . . . but that’s okay. I took Oliver’s hand and I held it. Well, the Great Blizzard has become the Great Melt. Though we made the best of it and I enjoyed being cozy with my boys, I was pretty claustrophobic by Monday. It snowed most of Friday and all of Saturday, finally stopping with 23 inches down by the early hours Sunday morning. Spencer did a great job keeping our driveway clear, but neighborhood roads were still impassable until Tuesday. With temperatures climbing into the 50s (Maryland weather is nothing if not ridiculous), the roads began to flood. On the one hand, I was quite relieved not to worry about ice. But now, of course, there’s the issue of refreezing . . . Anyway. Enough boring science stuff. We never lost power, so there was no need for The Bunker. I knew we had rations to get through the long weekend (and then some), but having no heat was another animal entirely — so I’m very thankful we lucked out there. We never ran out of diapers or formula or water or any of the other essential items I gathered like a rabid Gollum, afraid of someone swooping in to steal my preciouses. After the storm settled (literally), we went outside with Ollie for a grand total of, oh, ten minutes . . . long enough to snap a few photos. My sister and brother-in-law braved slick roads to come see the Ollie man and his first big snow. He wasn’t too interested. But that was mostly because of the dreaded jacket/hood combination. Back when Ollie was tipping the scales at 5 pounds and we stared at him all day, convinced he would stop breathing without our vigilance, going outside at all was a process. The day after he came home, we went his first pediatric appointment just a few miles away. The first night was horrible, of course. The month after Oliver was born but before he was released was the strangest of my life. I’d given birth, but our child wasn’t there with us. We made near-daily treks to his hospital in Baltimore, but . . . we had gone back to sleeping. I slept horribly throughout my pregnancy, especially toward the end. I could never get comfortable, especially since I’m a back sleeper (a no-no while expecting). After he was born, of course, I still wasn’t resting well . . . too many churning thoughts with insomnia. But when I could sleep, I did. For hours. Unbroken. For as long as I wanted, or could. As soon as our son came home, of course, that rest became an exotic memory. When we arrived at Dr. M’s office that first morning, I was practically frothing at the mouth. We had barely slept, Spencer and me, and I’d spent most of the night staring at this impossibly small child wondering where he had come from. No love lost for last May, that’s for sure. When we saw Dr. M and introduced our preemie, it was a relief to learn she had welcomed a premature child herself. Our biggest questions were, of course, How do we do this? Are we ever going to sleep again? We worried he was cold. Or uncomfortable in his snap-up outfit. I thought we were supposed to put pajamas on babies, not realizing that it makes no difference at all. So I’d forced a footed thing on him, thinking that was what we were “supposed” to do, only for him to spend the whole night miserably trying to kick it off. He is, and has always been, a kicker. I remember asking Dr. M what to do about the kicking. Terrified of SIDS, like all parents, I knew we could not have any loose bedding in his bassinet — but he just seemed cold and out of sorts. He kicked off anything we tried to put on him. She confirmed we could swaddle him . . . but he didn’t love that, either. Ollie hates being confined, so the wearable blankets we received are, um, ready to be passed along in pristine condition, shall we say. Dr. M was comforting. She reminded us, in her gentle way, that we are his parents. The nurses are gone; the NICU is gone. We are responsible for his care, and we make the decisions. “Sometimes you just have to say, ‘Little baby, I know what’s best for you, and this is what we’re going to do,’” she said. It seemed a little hokey at the time — especially given we feared Oliver was actually a vampire child, sleeping soundly during the day but alert (and shrieking) all night. But I get it now. Ollie definitely has his own personality, with likes and dislikes and temper tantrums for the latter. He despises anything being on his feet or head, so hats and socks and hoods are immediately shucked off. Don’t even try shoes. Jackets really irritate him — which is fun because, you know, it’s winter. And about 25 degrees. But as Ollie goes stiff-armed to avoid the sleeves, having a meltdown when I lift the hood to shield him from the cold, I summon my motherly courage — the mettle I guess I had in me all along — to give him the hair eyeball. Er, most of the time. Have to pick our battles, right? Until my son was born two months early, “prematurity” was a foreign concept to me. I knew friends of friends who had preemies and had heard stories over the years, sure, but did I think it would happen to us? With our first child? Not for a minute. When we took a childbirth class in late March at the hospital where we’d once planned to deliver, we were the couple with the furthest due date (June 5). Everyone else looked ready to pop. In reality, as I developed severe preeclampsia just weeks later, we probably delivered first. Oliver was born at 32 weeks gestation in April. By the end of this month, Ollie will have been out in the world longer than I was ever pregnant. This milestone brings a bittersweet mix of joy and relief, sadness and longing. My pregnancy went so fast, ending so abruptly. I’m still working through my complicated feelings about that . . . but that’s a post for another day. After our sweet 3 pound, 9 ounce baby boy came into the world, friends and family rallied around to offer support and strength. Though I wasn’t always in a good place to receive it, I did feel it — including from my friends here in the blogging community. Many friends contributed to a GoFundMe started by sweet Trish and Lyndsey, and we were so thankful for your encouragement and donations. I don’t know if I ever issued a public thank you, but if I didn’t, please know how deeply we appreciated that incredible kindness. It came at the absolute best time, and we thank you so much. November is Prematurity Awareness Month. We definitely know why I had a premature baby, though the exact cause of preeclampsia itself is unknown. Of the nearly 4 million babies born in the U.S. each year, preeclampsia affects approximately 200,000 expecting mothers. Less than 1 percent will have to deliver their baby before 34 weeks gestation . . . still, I was one of that group. Preeclampsia is defined as a potentially life-threatening pregnancy complication characterized by high blood pressure and signs of damage to the kidneys or other organ system, according to the Mayo Clinic. Left untreated, it can lead to seizures, stroke and maternal and fetal death. The only “cure” is delivery of the baby and placenta. In my case, my blood pressure began trending high around 30 weeks. I was monitored at home and admitted to two hospitals before doctors finally decided it was too risky to both my life and the baby’s to continue the pregnancy. The morning I was induced, my blood pressure was greater than 200/140. We needed to get the baby out immediately. So we did. He’s here, he’s perfect, and we love him dearly. Never for a moment do I take for granted how fortunate we are to have such a sweet, healthy child, especially in light of his two-months-early arrival. But I am still sifting through the emotional impact of that early, traumatic birth, as well as my own lingering hypertension issues. Much of my energy of late has gone toward getting a handle on the anxiety and PTSD I feel in the aftermath of Ollie’s birth. Every day is a process, a step forward. Though we’re very clear on what caused my son’s prematurity, many women will never know for sure what caused their early labor. An infant is considered premature if he or she is delivered at less than 37 weeks gestation. According to the March of Dimes, 500,000 babies are born prematurely in the U.S. each year — about 9.6 percent of births. More than 15 million are born too early globally. Most preemies will spend time in the NICU, the specially-staffed and outfitted intensive care unit for infants requiring support after birth. Our son was in two NICUs for almost a month combined before he was ready to come home. Since April, I’ve received messages seeking advice on helping other new preemie parents — and no matter what I’m doing when they come in, I drop everything to respond. Being just six months into our parenthood journey, my memories of our preemie’s delivery and the NICU experience are fresh . . . and if I can lend support to a family faced with a premature birth, I absolutely will. I need to. I can only speak to my own experience, of course, and do not speak for all preemie parents. What helped me may hinder someone else, and it’s always best to take your cue from the parents themselves. We all have different ways of coping with stressful experiences, and there is no right or wrong way to do so. But in honor of Prematurity Awareness Month, I compiled my thoughts on helping the moms and dads you know who welcome their children much earlier than expected — and what you can do now to be the support that helps see them through. After a friend or loved one welcomes a premature baby, your first step is easy: send your good wishes. They just had a baby! That’s amazing! Because many premature infants will face immediate medical issues and be admitted to the NICU, there may be a gut instinct to “tread carefully” when discussing their newborn. But don’t do that. The parents want to receive your congratulations and positivity. Though he was, of course, fragile and different, I didn’t want our 32-weeker to be treated that way. 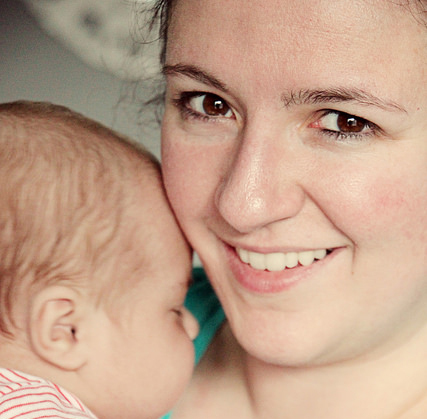 Desperately did I want to feel normal: just a normal mother who had welcomed a normal baby. Sensing others’ sympathy absolutely broke me in half. There is definitely a time for soothing words and compassion — but for me, immediately after birth was not it. In the beginning? Try to be upbeat. Hopeful. Enthusiastic. They need it. Our son was delivered at an urban hospital almost two hours from our home. After I was discharged, we began the arduous task of commuting — in D.C.-area traffic — to see him each day. The most frustrating part of daily life involved having to feed ourselves. I got angry — actually angry — at having to constantly stop to eat. I didn’t want to eat; I didn’t want to do anything but sit next to Ollie’s isolette, watching his chest rise and fall, and pump what little breast milk I could at his bedside. That was it. My husband was amazing, taking care of all logistics . . . but we couldn’t bring ourselves to go grocery shopping until right before Oliver actually came home. There was something too “normal” about going for groceries — something that threatened to break my heart. How could I do anything “normal” after what we’d been through? I couldn’t. So we didn’t. We needed to eat, though. Eating became a daily chore — and we spent a small fortune on take-out and hospital meals in the month Oliver was in Baltimore. I would have loved a home-cooked meal, but we were barely home to eat one. If you want to help a preemie parent, offer to bring them food. Make a casserole, lasagna, a Crock Pot full of soup — something they can eat and reheat, if needed, to feed themselves again. When babies are born, friends and family often gather to form a “meal chain” for the exhausted new parents. Even if their baby isn’t home, they still need that love and support . . . trust me. Food is about more than nourishment. For a preemie parent, it tastes of comfort and compassion and warmth. Make muffins they can eat on the drive to the hospital, or protein-rich cookies to tuck into bags for snacks. If you’re not a cook, offer to meet them at the hospital for a meal or to take them to a local restaurant. As time wore on, Spencer and I craved companionship and support at the hospital. We needed a distraction. Company provided that. If your texts, calls and emails go unanswered, understand the maelstrom of highs and lows they are experiencing. Don’t take offense if you don’t hear back quickly . . . and don’t take that as a sign that you should stay away, either. Though I didn’t always have the emotional energy to respond to messages, I read every single one (and usually cried — but that’s not a bad thing). Knowing people were thinking about and praying for us was a great source of comfort. It helped us feel less alone at the hardest time in our lives. If your preemie parent friend is anything like me, they might be uncomfortable asking for help. Though I eventually accepted — and welcomed — any and all assistance, it can be hard to reach out. Statements like “I’m here if you need anything” are well-meaning, but they’re not always helpful. Be specific. Say, “I’m thinking about you and want to help. Can I give you a ride to the hospital this week? What night can I bring you dinner? Do you need help with laundry or dishes?” If they have other children, offer to come spend time with them, help with homework, etc. My sister became a point-of-contact immediately after Oliver’s birth. She contacted my friends, work, etc., and became the go-between for family and friends seeking updates. Understand that preemie parents might not always have the energy to give updates about their baby, especially if they’ve already issued many that day. If you know another family member or friend who might have news, reach out to them instead. It’s still totally OK (and very welcome!) to send a “thinking of you” text to the parent, but that will save them from having to go into the nitty-gritty — especially if they’ve had a tough day. One of the kindest things done for us after Ollie’s birth came in the form of a care package — one from a virtual stranger. Jessie, a friend of my sister’s, had a premature child years earlier. After learning of Oliver’s birth, she arrived at our house one morning with a bag of presents. I cry just thinking about this woman’s kindness. I actually can’t think about it much, because it almost hurts — in a good way. Preemie parents are truly a tribe. In this bag were goodies for our new baby, yes — but just as many for us. She was the first person we talked to who really understood we were going through something uniquely hard and painful . . . which made sense, of course. She’d been exactly where we were, and came out the other side with a beautiful child. To put together a collection of support-related goodies for a preemie parent with a child in the NICU, you could include . . .
Portable snacks like trail mix, Rice Krispie bars and peanut butter crackers. We threw them into a diaper bag for our journey each day, and frequently snacked on those when we didn’t have the time or energy for a hospital meal. Unscented hand lotion. Your hands dry out quick from all that scrubbing in, trust me! Magazines. Everyone needs a little mindless entertainment and distraction now and then. Preemie clothing. As it’s unlikely your friend planned on having their baby early, they probably don’t have clothes for him or her. One or two onesies is enough; babies aren’t initially able to be dressed in the NICU and, with any luck, their child will be close to wearing newborn-sized clothing at discharge. Preemie clothes can be tough to find, but we had luck at Walmart and Target. A blank journal or notepad. Mine came in handy for jotting down notes from doctors and random thoughts when I needed a private outlet. Gift cards for gas, food or the movies/Netflix. Though your parent friends won’t initially want to take time for themselves, this may help remind them they’re allowed to get a real meal or decompress with a film. These are just suggestions, of course. You know your friend best. If she loves to knit or crochet, include skeins of colorful yarn she can bring to the hospital. If he loves chocolate, bake homemade brownies and pack them in individual plastic bags. And if you want to really surprise a new mom, bring her a new top. Chances are her pre-pregnancy clothing will not fit, and no preemie mom wants to even look at her maternity clothes . . . let alone wear them. Six months after birth, maternity clothing is still a painful trigger for me — and one of the first things I had to do after getting out of the hospital was buy new shirts and pants. I felt completely broken, inside and out, but a few tops that actually fit my swollen body — and weren’t maternity wear, reserved for the lucky women who were still pregnant — gave my spirits a boost. Though the initial weeks after birth were too chaotic and consumed with Oliver’s needs to worry about our own, there came a time when I was ready to reach out. And not only was I ready, but I was desperate for support. A quick Google search for “preemie parents” yields half a million results — but I’ve found the most support on Facebook. If your preemie parent friend seems open to it, send them a note with links to Life After NICU and Parents of Preemies Day. Great resources are also available at March of Dimes, Preemie Babies 101 and Graham’s Foundation. On Facebook, not only do other parents ask questions (many of which I’ve had myself! ), get real responses and find camaraderie, but both groups frequently post stories of little ones who have gone on to do great things — and share photos of preemies hitting all sorts of milestones. The atmosphere is one of celebration, and I look for updates daily. Those “happy stories” were crucial to getting me through the early weeks of Oliver’s hospitalization. Everyone is different, of course. Some parents want to talk about their prematurity experience (I do, clearly! ), and others don’t. For some parents, it will be too soon to reach out in the aftermath of their early delivery and NICU experience . . . but don’t let that stop you from trying. Remember their journey doesn’t end when their child comes home. He or she may face continued health issues — apnea, oxygen support, etc. — and will likely be isolated at home, especially for the first few months. That means your friend may be isolated, too. Being a parent to a newborn is incredibly hard. It is frequently overwhelming with moments of the purest joy, but can also be lonely. Being a parent to a preemie newborn? It’s all of those things wrapped into a package tied with a ribbon of anxiety, plus physical and emotional exhaustion. Your friend will need love and support. Don’t take it personally if you’re not immediately invited to see the baby. At the hospital, NICU rules are strict and often family-only with no children permitted; only two people were ever allowed in Ollie’s NICU at a time, and one always had to be a parent. When their baby is finally discharged, parents face dueling emotions: excitement and joy that their child is finally coming home, and fear at the thought of caring for them away from the calm guidance and experience of the NICU staff. The risk of infection — especially during cold, flu and RSV season — is especially worrying for preemie parents. They will likely plan to sequester their child, letting him or her get acclimated to the outside world with limited exposure to others for weeks or even months. If your friend is able to take a break from the needs at home (and oh, how they will need a break), offer to meet them out for a quick lunch, coffee or just to help run errands. Tell them you’re dropping off a meal (remember, food is important! ), but emphasize that you know they’re concerned about the risk of infection and will stay outside. If you don’t live nearby or can’t come in person, continue to send messages of support. After Ollie came home and my husband had to return to work, I was often overwhelmed by loneliness and worry. My early entrance into motherhood was a shock to my system, physically and emotionally, and I was unprepared. Each note of encouragement really bolstered my spirits. More than anything . . .
Just be there, and let them know you’re there. Reach out as much as you can with the understanding that it could be hours, days or even weeks before you hear back — but your words still matter. The fervent prayer of the preemie parent is that, with time, love and patience, their babies will grow from vulnerable infants we can hold in our hands to healthy, happy, curious and loving children. Be a trusted friend to us on that journey. We need you. Oliver successfully took his first plane ride. On our way to visit family outside Buffalo last week, we opted to take a one-hour flight rather than make an eight-hour drive — a choice that wasn’t without its stresses, but was ultimately wise. I was ridiculously nervous to fly with an infant. Much of that anxiety probably stemmed from being seated by wailing babies on multiple flights (most of them cross-country, of course), and we didn’t want to be “those people” who have a child losing it in the dense confines of an aircraft. I didn’t know how I would deal with the stares and grimaces. People can be ugly . . . especially when traveling. But oh, our Oliver. He barely made a peep on our way to and from New York. He got upset just once, letting out a frustrated shriek before beginning to wail, but that was aboard a shuttle bus on our return yesterday — when we were just a few minutes from the car. A diaper change quickly calmed him down, as did being back in his normal car seat. So we’ll take it. Sailing by Baltimore on our way home, we looked down at the city with its spires and stadiums. Among them is the tower, a spindly historic structure that sticks out prominently among the modern buildings downtown. I can’t see it without thinking of the day before our son was born, how we studied it as minutes bled into hours as our family celebrated at my baby shower many miles away. The tower was the only interesting thing to look at on the most stressful day of my life. It was mid-April, and spring appeared overnight. We watched the pear trees burst into bloom from our corner room, startled by their bright contrast against the dark tower. The sun was brilliant. It was a perfect day. And it was also interminably long, waiting to see if my blood pressure would stabilize. If we could go home. If I would stay pregnant. If our baby would come. Through those dark early days, I couldn’t have imagined a future where Oliver was healthy and so physically on track, giggling and “dancing” and smiling at the sound of our voices, the sight of our faces. Everything felt scary. Nothing was normal. I didn’t know how to have a baby, much less a preemie baby. I was afraid. But spring arrived, brilliant and new, and soon became summer. Oliver flourished, and Oliver came home. We poured our love and attention into helping him grow. He’s now our not-so-little love, and all 17 pounds of him cry out for hugs and kisses. We give them. He now sleeps through the night (more on that to come), so we are all sleeping through the night. I am less zombie, more relaxed mother. Summer is swiftly turning to fall, all crunchy leaves and roadside apples and steamy pumpkin drinks. We are learning to “talk” and play, to stand and mimic and grip. We are laughing. We are happy. And I am learning, too . . . so many things since April. Like how to let April go. On our plane ride home, Oliver clutched Spencer’s finger in one hand and mine in the other. He watched the skies intently through our tiny porthole, dark eyes dancing across the clouds. We encircled him, our dear child. The tower disappeared from sight.